Surprise everyone at your next party with these delicious party finger foods. You are sure to be the hit of the party! Instead of always bring the same boring snacks to the party, opt for these fantastic and creative party finger foods instead. Click on the link below each image to view the full recipe. Bourbon BBQ Little Smokies are a flavorful appetizer that’s easy to make and oh so good! They are the perfect fit for any occasion or get together! These bites are the PERFECT finger food or appetizer! Adults and kids alike go crazy for them. If you are looking for a people pleasing recipe and/or appetizer, this recipe is fantastic! The flavor is delicious and they are cooked to perfection! How fun are these little Taco Cups made in a muffin tin?? I don’t think I’ll ever find another taco recipe I love more than these wonton tacos. They have double layers of crunchy taco shell, seasoned beef, spicy tomatoes, and gooey cheese all in one perfect bite! Just like the restaurant-version, except it’s so much cheaper to make right at home and it tastes a million times better too! It’s highly addictive and extremely delicious. Smoky, sweet, crunchy, buttery, chewy — the perfect conglomerate of badassness. And it has only four simple ingredients, all of which you probably have in your pantry right now. Delicious crab and cream cheese are the perfect combination. This is one of the easiest recipes to put together and my guests always rave about them! Cheese filled tortellini that’s fried to golden perfection and dipped in warm marinara sauce. Garlic Parmesan Clam Stuffed Mushrooms are perfect for the seafood lover. 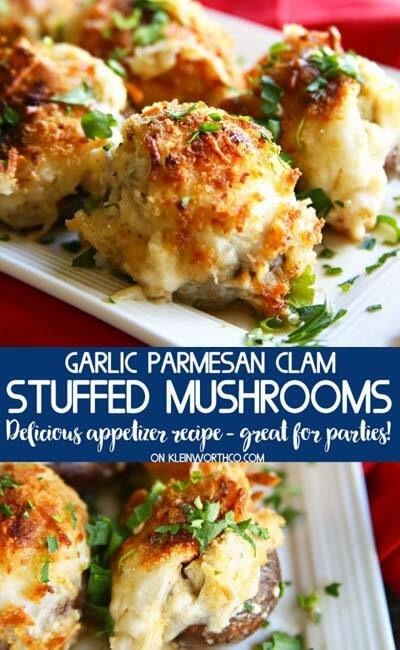 Loaded with minced clams & 3 types of cheese make these the perfect appetizer. This one is a definite crowd pleaser. There are only 4 ingredients and one of them is bacon. How could you not want to give these bad boys a try? This recipe for Mexican shrimp bites is seared shrimp and guacamole layered onto individual potato chips. A super easy appetizer that’s perfect for entertaining! This is my favorite way to eat chicken meatballs. They’re spiced up with a sweet, savory, and spicy firecracker sauce. They’re tender, filled with flavor, and require minimum work! This dip is so divine you really don’t even need anything for dipping. It’s light and fluffy and perfectly creamy. These pizza puffs are not only delicious, they’re quick and easy to whip up! The texture is nice and fluffy with a cheesy flavor! It’s really easy to make. 6 ingredients and 30 minutes are all you need for this cheesy garlic pull-apart bread. Serve it as a side, an appetizer, or a snack. Bring it to a potluck or tailgate party to knock everyone’s socks off! Spinach Balls are always a crowd-pleasing party favorite. With the delicious combination of spinach and stuffing mix, who can resist? Zucchini slices are coated in parmesan cheese and panko breadcrumbs and then cooked until crispy. They make a great appetizer or side dish. Oh Taco Pinwheels, I can’t stop, wont stop!! All you need is puff pastry, taco meat, tomatoes and cheese plus a few bowls of toppings like guacamole! The BEST Sausage Balls are guaranteed to be a hit at your next party! So easy to make and perfect for game day! We like to dip them in ranch, BBQ sauce, or marinara – so good! This cheesy, creamy Beer Cheese Dip Tear Apart Bread Bowl is a crowd-pleasing appetizer that your guests will love! These Cranberry and Feta Pinwheels have a sweet and salty combo that is the perfect Christmas appetizer. The sweet cranberries with the tangy feta and onions make this 5 ingredient appetizer not only easy but delicious. I like to use spinach tortillas for an extra holiday touch. You’re going to love these! 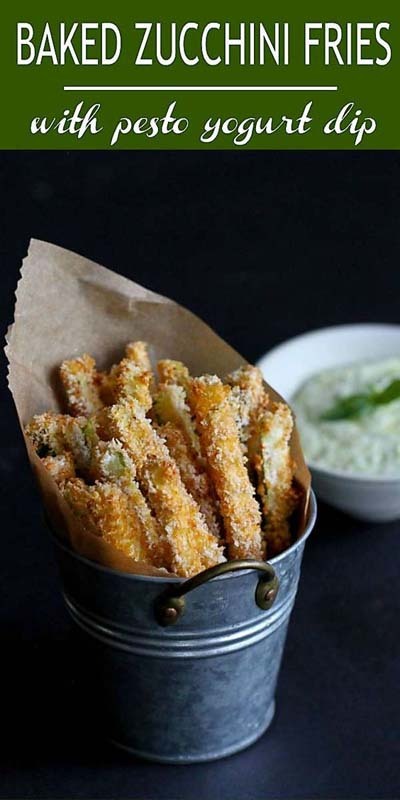 Zucchini gets transformed into healthy, crispy, golden brown baked zucchini fries with a 3-ingredient pesto yogurt dipping sauce. Sweet potato bites with avocado and bacon are a sweet potato appetizer recipe that is perfect for serving to a crowd. Baked sweet potato slices topped with fresh avocado and crisp bacon. Great finger food for game day! Paleo, gluten free, dairy free, and DELICIOUS. Who could ask for anything more? Wow! What a great discovery! Breakfast you can eat with your fingers and dip in syrup, rather than pour syrup all over it. Quick, easy, and totally delicious, these Mini Candied Pecan Cranberry Goat Cheese Balls make a tasty party appetizer for fancy yet fuss-free entertaining! And it can be ready in 15 minutes! Love buffalo wings? If you do, you’ll love these! 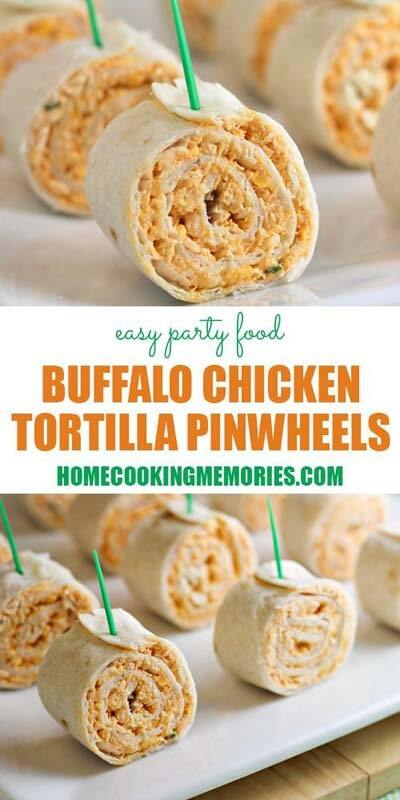 This Buffalo Chicken Tortilla Pinwheels recipe makes a delicious party food with all the flavors of buffalo wings and blue cheese, but without the mess. Kahlua Pecan Brie Bites – only 5 ingredients! Can assemble ahead of time and refrigerate until ready to bake. Perfect party food! This tasty zucchini garlic bites recipe combines shredded zucchini with garlic, Parmesan cheese, fresh herbs, and is served with a marinara dipping sauce for an Italian inspired twist. 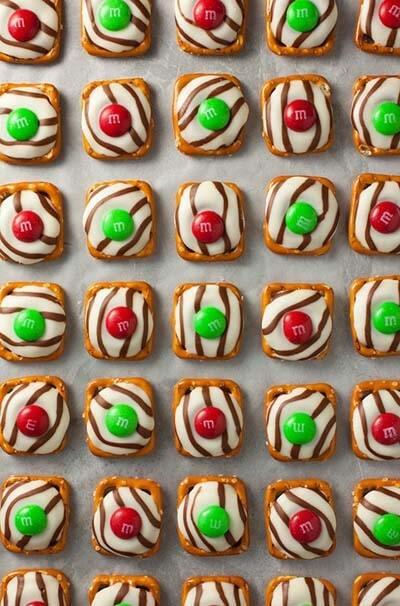 These Pretzel M&M Hugs are the perfect little festive treats for Christmas parties or gifts. They take no time at all to make and couldn’t be easier plus they look so impressive! Mini Cheese Ball Bites are studded with dried cranberries and blue cheese, rolled in pecans, and skewered with pretzel sticks for fun, easy party appetizers! Jalapeño Popper Wonton Cups are loaded with bacon, jalapeños, cream cheese, cheddar cheese, and sour cream….all in a crispy wonton shell. This easy appetizer comes together quickly and is perfect for parties or game days. If you love jalapeño poppers, you’ll LOVE this delicious twist! Easy potato skins recipe topped with cheddar cheese, crumbled bacon bits and taste great topped with a little sour cream! The perfect appetizer for any party! These Pomegranate Goat Cheese Bites with Honey and Thyme are an easy party appetizer that is sure to impress your guests! Perfectly balanced with tangy goat cheese, tart pomegranate arils and a hint of honey, these bite sized holiday party appetizers will disappear in seconds! These easy sausage cheese balls are the perfect appetizer, they’re packed full of savory flavor! Try serving bisquick sausage balls at your next party! The classic little smokies appetizer gets an upgrade from the cayenne and brown sugar rub, not to mention crispy bacon wrapped around the smokies! These gluten-free chip and guacamole bites are so fun to bring to parties and potlucks. Pin these Party Finger Foods for later! 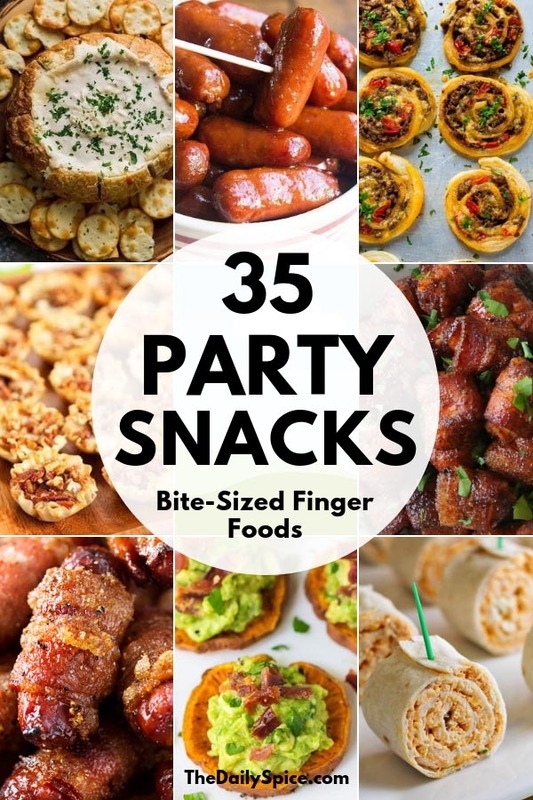 Don’t forget to pin these party finger foods to Pinterest so you can get back to it later! Also follow The Daily Spice on Pinterest for more great recipes and ideas! What Is Ketosis and Why Does It Work? At The Daily Spice we provide short and sweet articles pertaining to everything and anything to help you spice up your life. Our topics include life, health, wellness, nutrition, fitness, holidays, and more. We strive to connect deeply with our audience and give them recipes, advice, and entertainment worth sharing with their friends, family, and the people who matter in their lives. Copyright @2018 - thedailyspice.com. All Rights Reserved.